You will find this book to be an amazing showcase of Robert's body of work. He brings a fresh perspective to every room, whether it be very traditional or more contemporary in style. I was thrilled to see entire chapters devoted to both collecting and to art. Enjoy! 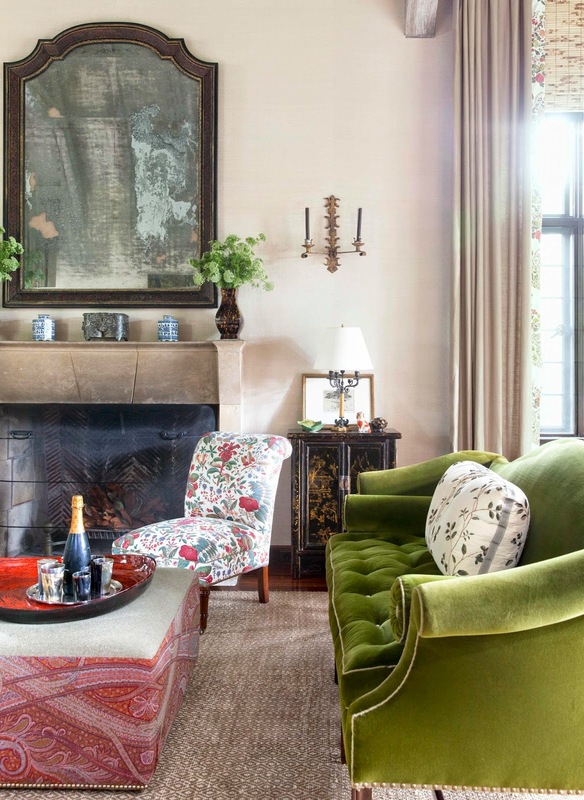 One of a pair of vibrant green velvet Chippendale settees graces the corner of this living room in a Locust Valley home. 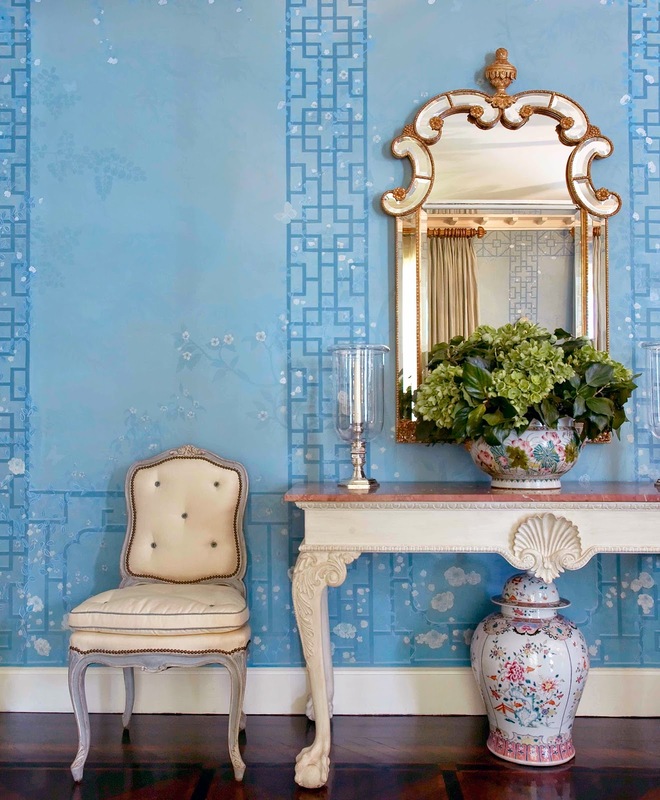 The living room walls in this New York townhouse are upholstered in a rich blue velvet. 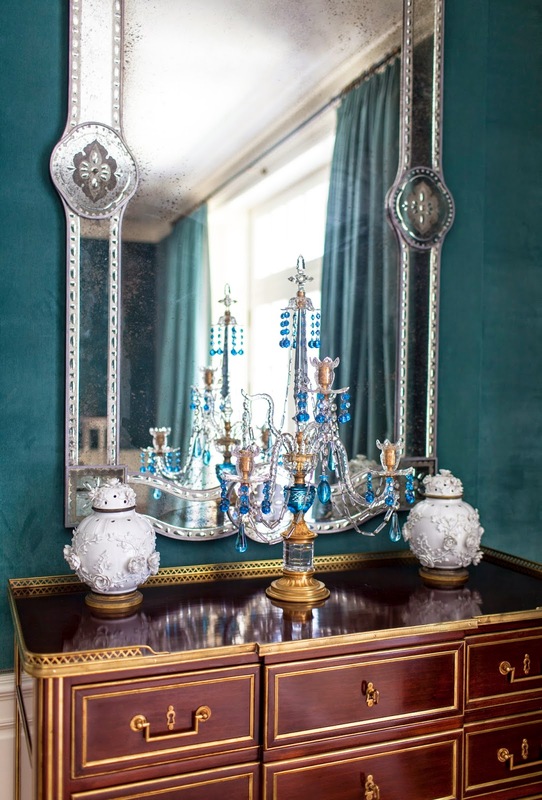 The Victorian crystal and glass girandole is stunning! The upholstered sleigh bed is just one of the many details making this Master Suite unique and fresh. The lighting is another! 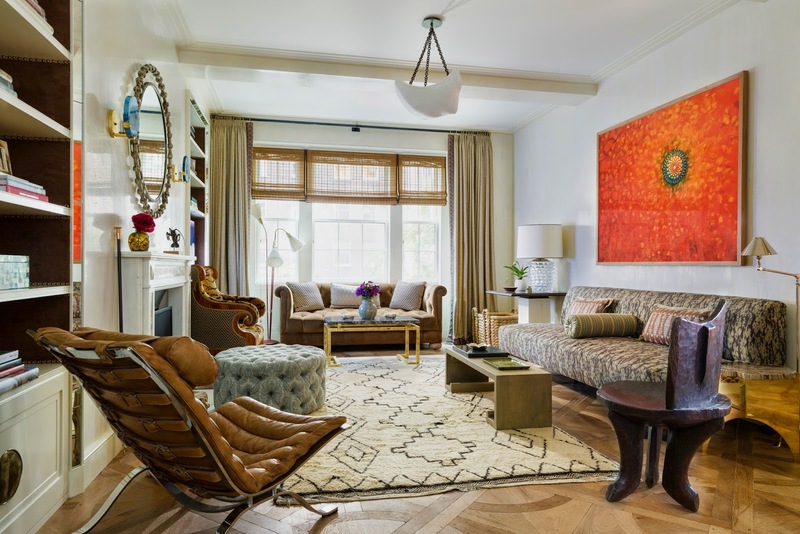 A living room filled with many periods of furnishings and art in this New York pied-a'-terre! 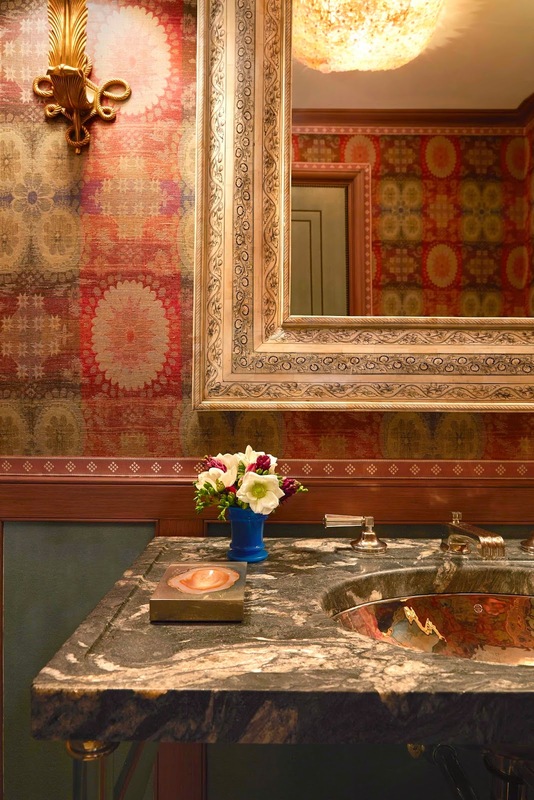 Markham luxuriates in designing little jewel box-like powder rooms for his clients! You will see many fine examples in his book. 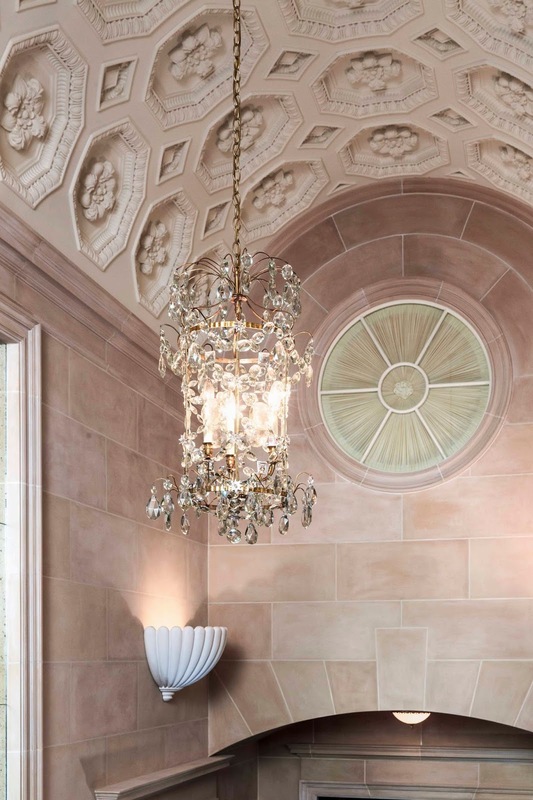 The Greek and Roman Galleries at The Metropolitan Museum inspired the vaulted, coffered ceiling of this two-story stair hall in this Carnegie Hill triplex. One of the very best books of the season, you will want to add this to your library to enjoy year after year! Please purchase at Amazon or your local book seller. Thank you to The Vendome Press for this fine publicity copy. Much thanks to my Friends and Followers who support The Arts! Please sign up for email updates to receive my latest features! At the start of Paris Fashion Week, I cannot imagine a more appropriate book to offer you a glimpse into the intricate makings of couture fashions. Every page of this book is filled with lush images that will make you gasp; I certainly did! Enjoy! 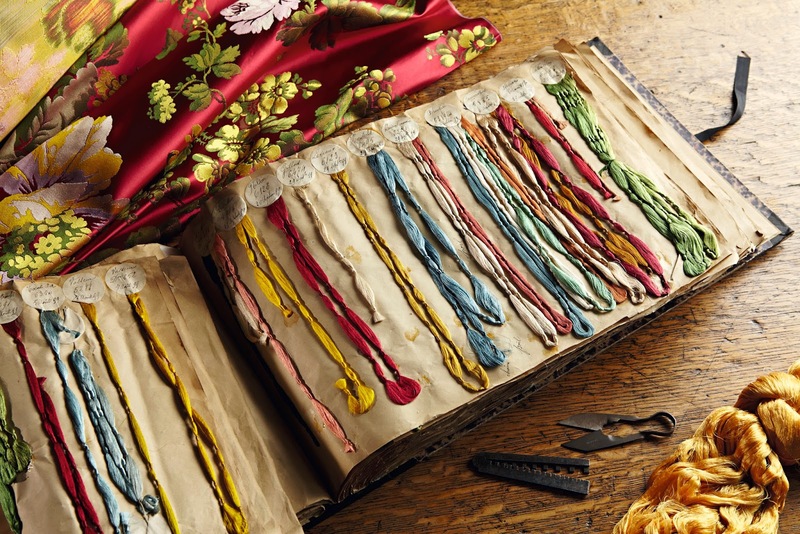 Color sample book with skeins of silk yarn used from 1898-1900 Designer: Prelle; Photo Credit: Alexis Lecomte. Cape Dress by designer Stephane Rolland in sand colored muslin and jersey, embroidered with burnt ostrich feather flowers. Photo Credit: Olivier Buhagiar. 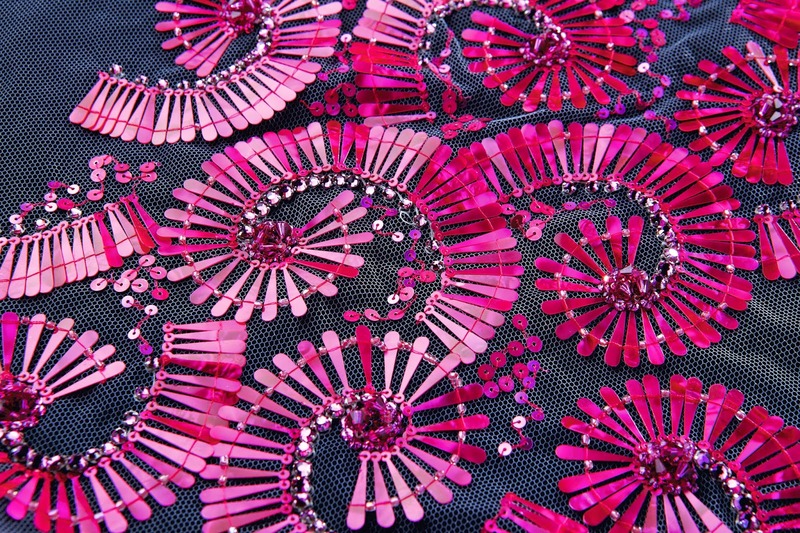 On white tulle ground, fuschia Rhodoid scrolls set with glass stones and sequins. Designer: Broderies Lanel; Photo Credit: Alexis Lecomte. Long Bustier Dress in dipped lambskin and cloud gray chiffon. Glass petal plastron. Summer 2013. Designer: Stephane Rolland; Photo Credit: Olivier Buhagiar. Marian Chopineau for Yiqing Yin. "Eole dress with Swarovski elements and red silk streamers. Sur le Fil Collection spring-summer 2013. Designer: Yiqing Yin; Photo Credit: Shoji Fujii. Pink silk slip dress, edged with embroidered tulle. Designer: Fanny Liautard: Photo credit: Alexis Lecomte. Metallic leather dress with Sophie Hallette lace applique. Eagle Eye Collection Winter 2013: Designer Oscar Carvallo; Photo Credit: Alexis Lecomte. 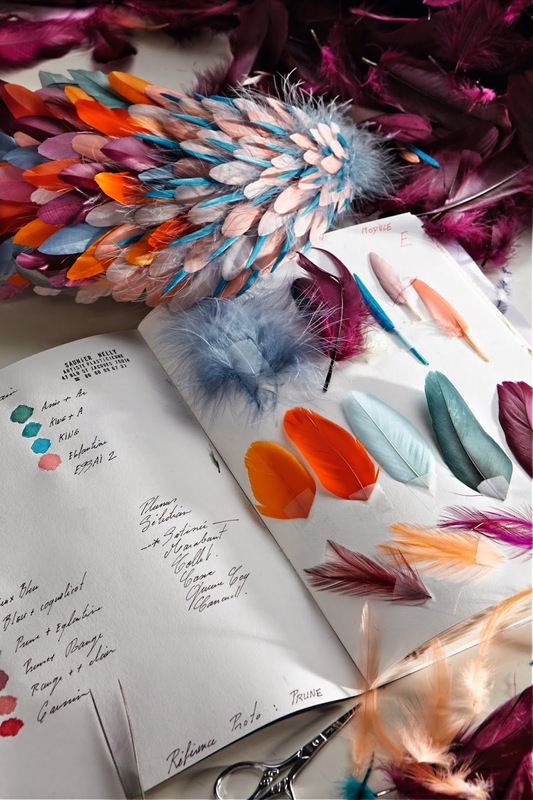 Design of notebook containing a list of materials, colours and dye references, as well as feather samples. 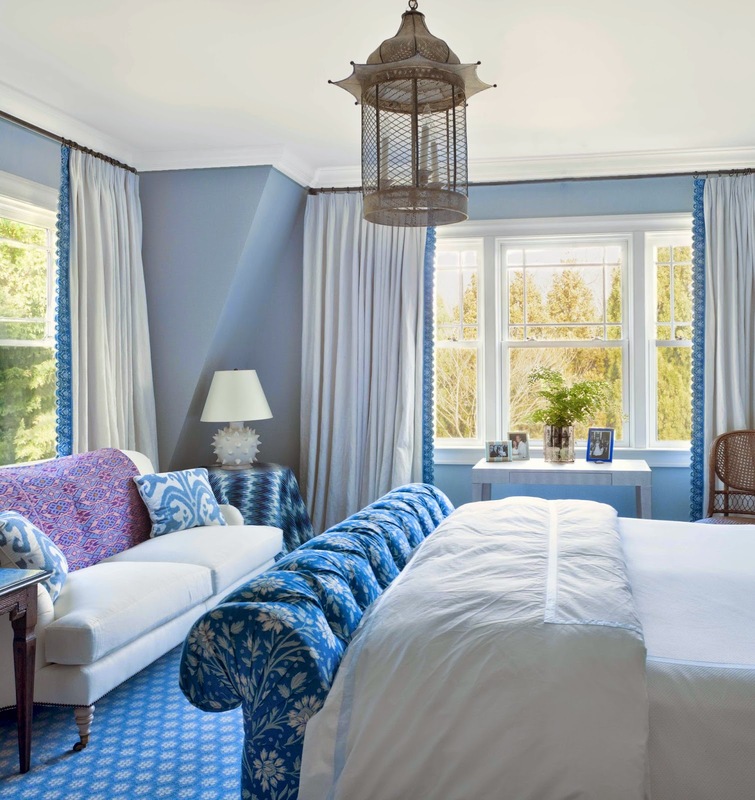 Designer: Nellie Saunier: Photo Credit: Alexis Lecomte. 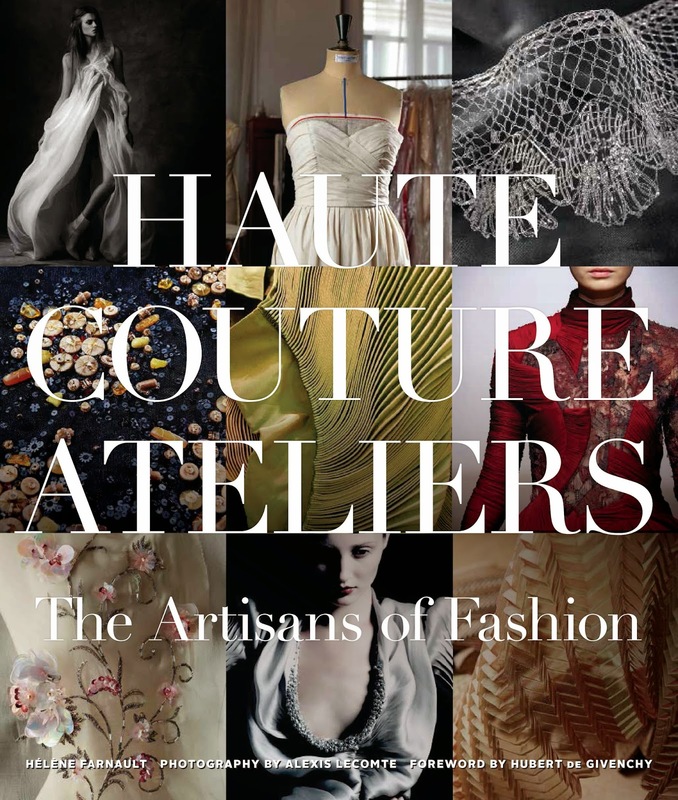 A book collector's dream, Haute Couture Ateliers: The Artisans of Fashion by Helene Farnault, forward by Hubert de Givenchy may be purchased at Amazon or your local book seller. You will be thrilled to see the work of the artisans who behind the scenes, assist in making these couture confections come to life! Thank you to The Vendome Press for providing me with the publicity copy. Thank you to my Friends and Followers who support The Arts! Please do leave a comment as they make my day! Sign up for email notifications to keep up with my latest features! It was only a few years ago that Darryll left the life of commercial and celebrity assignments on the west coast and chose the field of fine art photography. Now residing in his hometown of Chicago, his art is in the permanent collections of such renowned institutions such as the Metropolitan Museum of Art in New York, The Art Institute of Chicago, The Museum of Contemporary Art Chicago, The George Eastman House, The Norton Simon Museum Pasadena, and The Museum of Contemporary Photography, as well as in many private collections. As you can see from these selections, his art draws you in and does not want to let you go. You seek more, looking at the action, the blaze of colors, questioning yourself as well as the art itself. How is it that such fine movement and intriguing sound can emanate from these works of art...they do! Please enjoy my conversation with Darryll below. Where do you find the inspiration for your works of art? Many things inspire me and thus I am fortunate that I never seem to be at a loss for ideas. 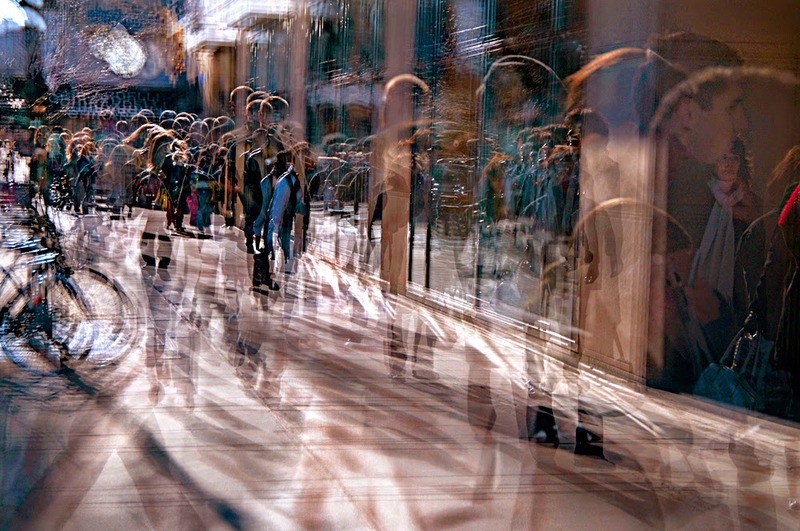 However, there are themes that seem to recur in my artwork, reflections of modern life, especially in these fast paced times and how this affects peoples’ interactions, our “dance” through life, and perceptions versus reality; something a camera is particularly suited to capture. How did you make the decision to work in large-scale format? I do also make prints that are more of a “normal” size, but working large is a combination of what I feel is necessary for my pictures to effectively communicate my ideas, as well as what has become almost the norm for true fine art photography that competes with other art forms, such as painting, fine art video, and sculpture. Going hand in hand with this is having small, limited editions of each work. Depending on the piece, I will only produce 3-12 prints, no more. 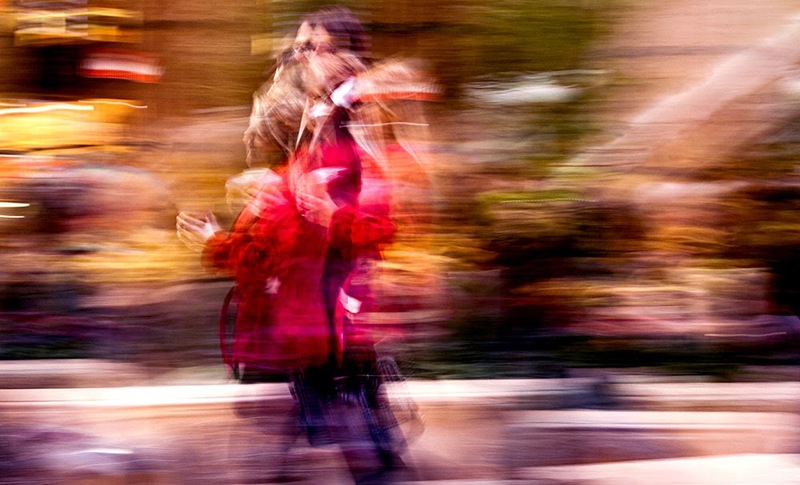 Tell us a bit about the process that brings your fine art photography to life. The movement in them is so intriguing. This movement you see gets back to how I want to reflect the times we live in. But as far as my process goes, it is something that has evolved. I would say necessarily evolved, as I have grown as an artist. I started going to art classes when I was 10 years old, at the Art Institute of Chicago, and my mother and one of my sisters are accomplished artists, so from early on I have had an amazing background in fine art. Almost from the start of my photography education and career, I approached the camera as a tool, as more of a paintbrush, rather than being so concerned about things such as having the newest gear, the absolute sharpest lenses, etc. While to a certain degree that might be important, those are just technical things, rather than technique and vision, which are important components of art. Who are the other artists with whom you have found insight or encouragement from- either from them or their works? For artists, I have to start with Arthur Siegel, who was head of the Photography program when I was at college at the Institute of Design, at the Illinois Institute of Technology. (I note the Institute of Design was started as the New Bauhaus by Maholy Nagy, from the original Bauhaus in Germany). Arthur was a very serious, a bit cantankerous, and a no-nonsense, fantastic educator. Many students were somewhat put off by his personality, but there was a great rapport between us. He taught me, among other things, that I must strive for perfection, both technically and artistically. My mother and sister also showed me the dedication an artist needs. There are so many other artists whose work influence me... but I will name a few: Frederick Sommer, Alfred Steiglitz, Cartier Bresson; classical artists like Rubens, Goya, Titian; and modern artists from Picasso to De Kooning to Pollock. Do you have any upcoming shows scheduled and where can our readers view your fine art photography? We are trying to be very selective about the shows my work appear in. After a very successful Photo L.A. earlier this year I decided I needed a “team” to work with me to help and take over a lot of these types of things. The most important way for me to use my time is to be working on my art. I added a new assistant and am also working with Paula Winke, a marketing and public relations consultant. I am fortunate to be working with great people. I sell a a great deal of my art to private collectors. I also consult with interior designers and architects to source my fine art photography on luxury residential and commercial projects. Beyond that we are reaching out to corporate art consultants and international galleries to explore exhibitions for the future. The best way to see art is to see it in person. My work is, among other places, in the collections of the Metropolitan Museum of Art New York, the Art Institute of Chicago, the Museum of Contemporary Art Chicago, the Norton Simon Museum, The Pasadena, and George Eastman House in Rochester N.Y. If you or your readers get to Chicago, please email me. I schedule regular studio visits, by appointment. Finally, Darryll, What words of wisdom do you have for the aspiring artist of any age? To be successful at something, regardless of how much talent you have, it takes a lot of hard work and reaching very high levels of technical skill before you can really use that in your own special way. Do not underestimate the value of knowing art (and photography) history. Picasso was a wonderful example of this. If you see his early works you will understand how great a technician he was and how skilled of an artist he was. He would not have able to achieve what he did with Cubism without that. Thank you so much Darryll for your insightful thoughts for our readers to enjoy. Be sure to watch this incredibly exciting Video in praise of Darryll's work on his site. 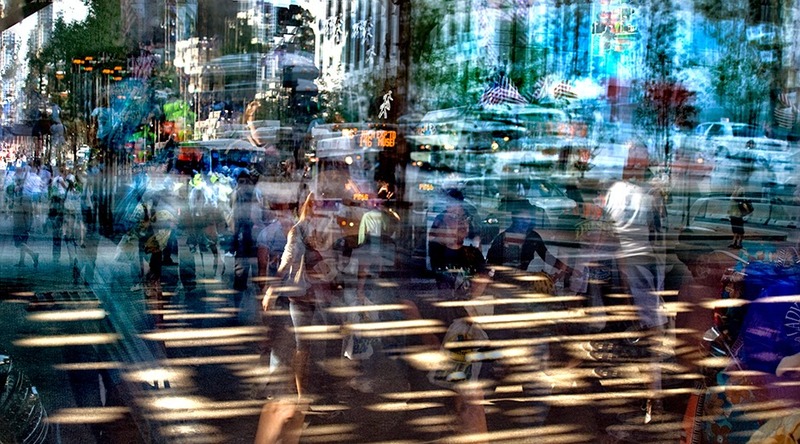 Darryll's website of his fine art can be found at Darryll Schiff Fine Art http://www.schiff-art.com/. It really captured my attention and will yours! 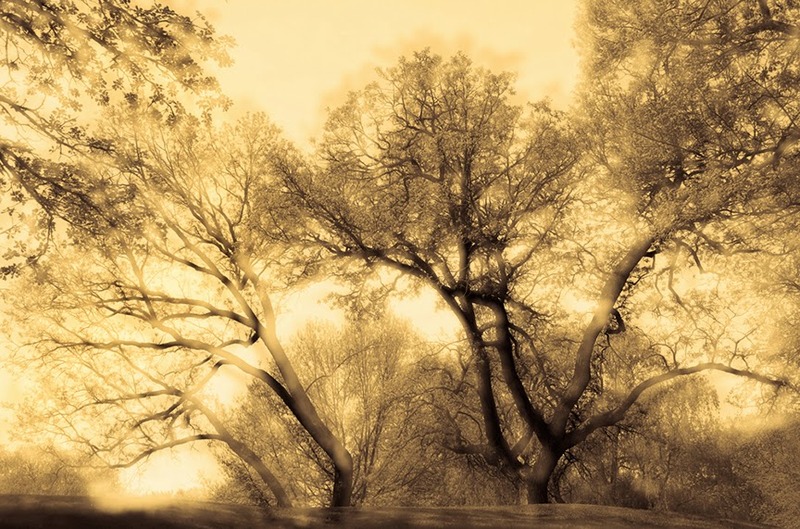 Read Darryll's fascinating Blog, DEFINEART to hear and see his latest works and ventures. Much thanks goes to Paula Winke, marketing and public relations consultant, who made the introduction. 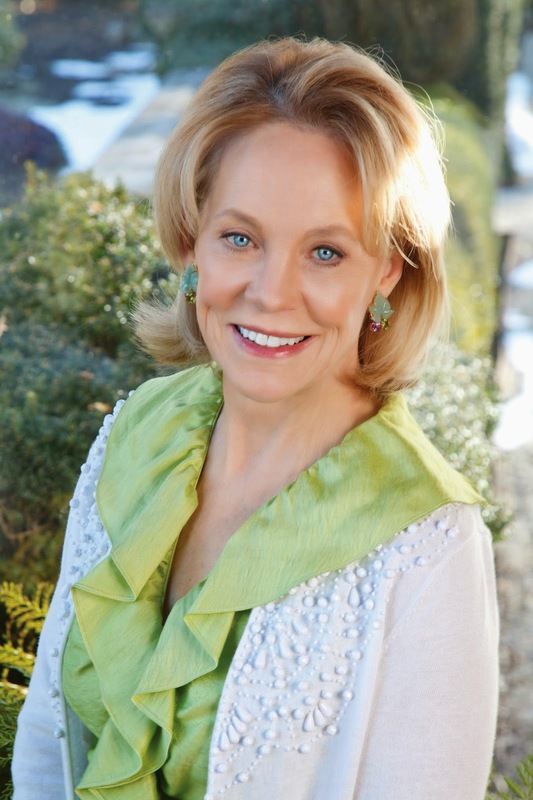 Paula is based in Kansas City; however her work with clients takes her throughout North America and abroad. Please leave a message as they make my day! Though it is mid-September there are so many gorgeous days ahead to enjoy that I want to feature a book that actually brings us the feeling of the sea, the sun and fresh air all year long. A spectacular view from Clingstone, a historic Newport estate sitting atop a large rock ledge, captures the image of two restored classic wooden boats amongst other vessels. 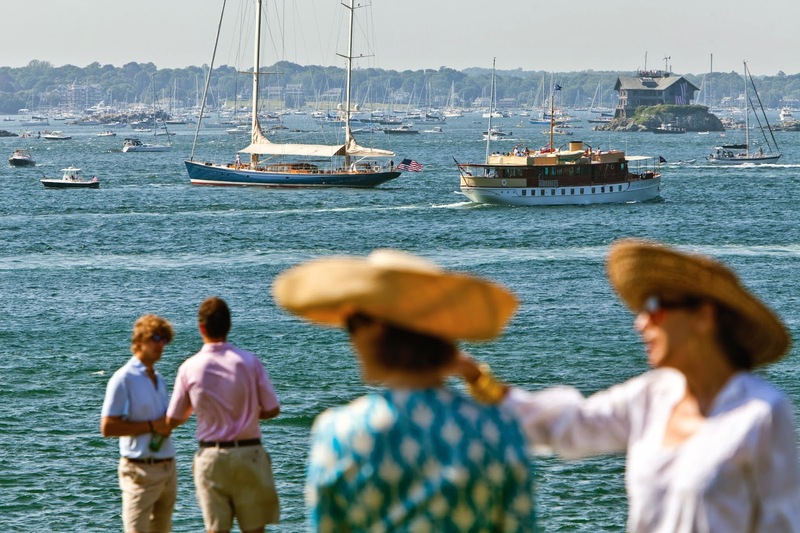 Newport, Rhode Island, conjures up so many images: stunning seascapes and world-class sailing competitions, including The America's Cup. The Jazz Festival and Annual Flower Show, not to mention mansions built by some of the most celebrated Americans of all time. 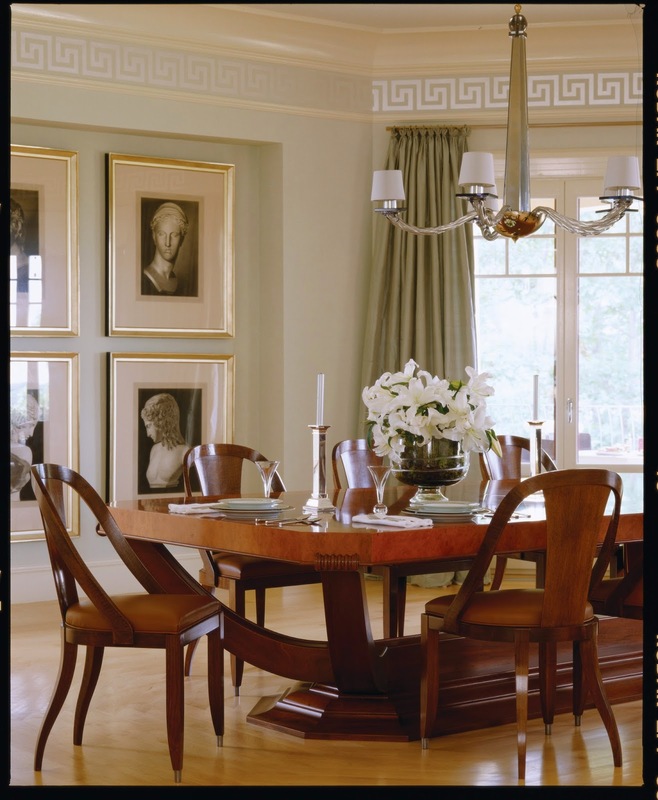 The art deco Emile Rublmann inspired custom Dining Room table (doesn't it resemble the curves of a ship?) 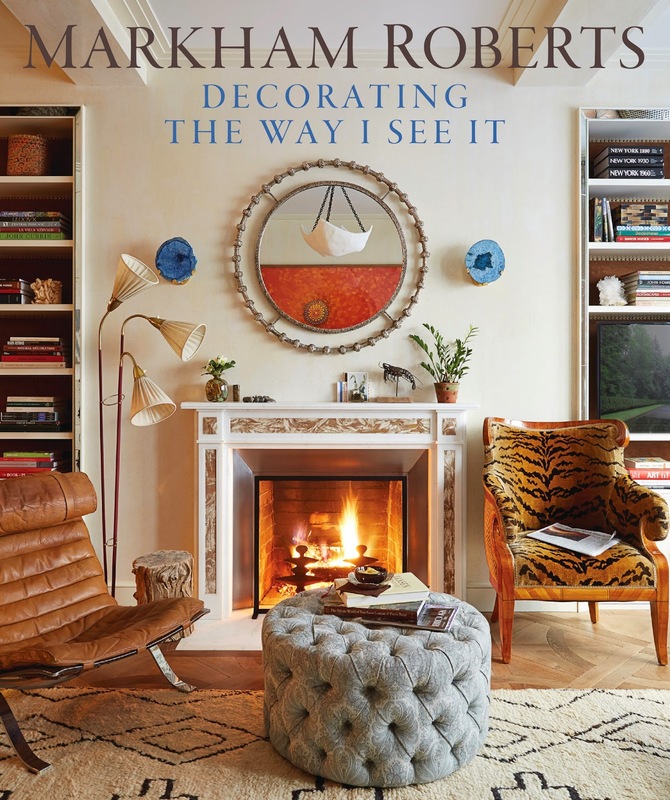 in the home of Interior Designer Eileen Marcuvitz and her husband Andy. This book honors both the "Old Guard" and their heirs as well as the "New" Newport Social Set who not only continue in the traditions of this fabled town, they also cherish and honor the spirit of the many historic homes when renovating, remodeling , or building a property. 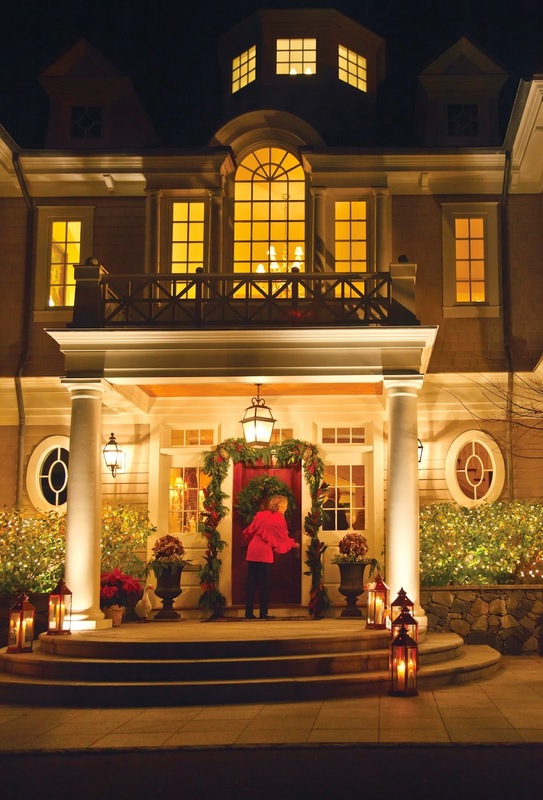 This Peter Weber built home includes cedar shingles with a cupola, large wide columns, and windows redolent of a bygone era, Mary and Tom Gilbane generously open their home for entertaining at the holidays. There are so many time-honored traditions that take place in Newport that you will enjoy reading about, the Coaching Weekend being another one that is enjoyed by hundreds of residents. These coaches with four horses stop along a route throughout the day to entertain and be entertained, ending the evening with a black-tie dinner at the Cushing Estate, The Ledges. 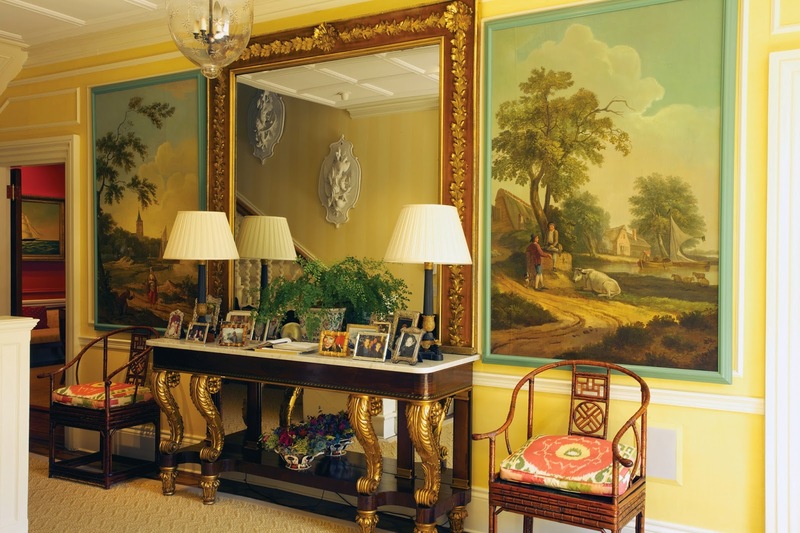 A gilt console and mirror are treasures from the Andy Warhol Estate which grace the foyer of Oakwood. Oakwood's six walled acres are very private, yet only a short walk to town and the harbor! The dining room also features 56 hand painted Chinese panels, truly remarkable. The very talented Bettie Bearden Pardee is also the author of Private Newport, At Home and in the Garden and two additional books on entertaining. She chairs many events of the Newport social season and loves to entertain at her own home, "Parterre". 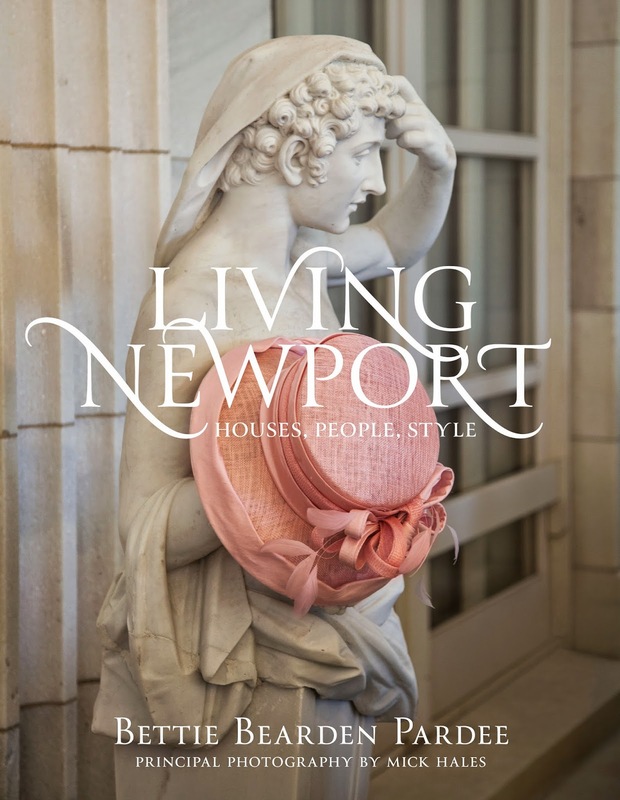 You may purchase Living Newport, Houses, People, Style at Amazon or your local bookseller! Thank you to my faithful Friends and Followers who support The Arts! Please subscribe by email to keep up with my latest features! I hope you will leave a comment as they make my day! Also thank you to all for the wonderful well wishes recently! It seems a very good time to tell you about the latest publication of White Trash Uncut by Christopher Makos as I just had 22 staples removed due to my latest surgery and have felt all pinned together! 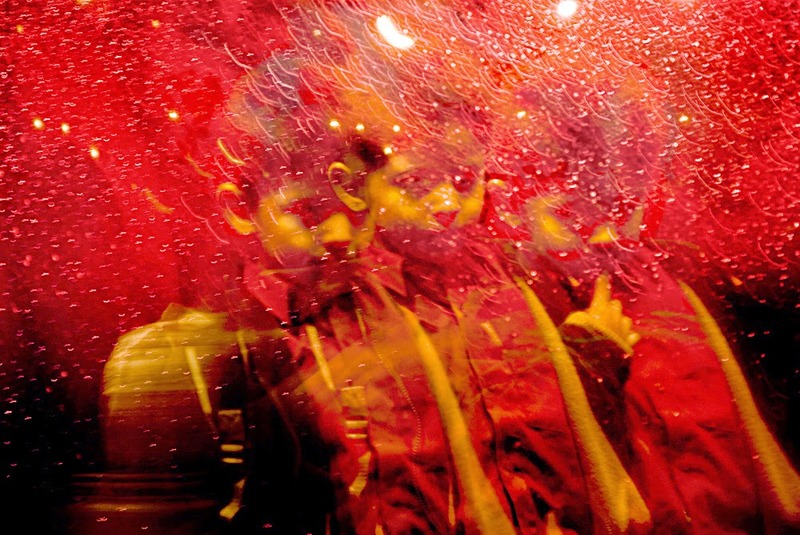 Containing images from the Super-Punk Rock days; these rockers broke outside the box and were some of the first to garner attention for their music through their look, their total package. 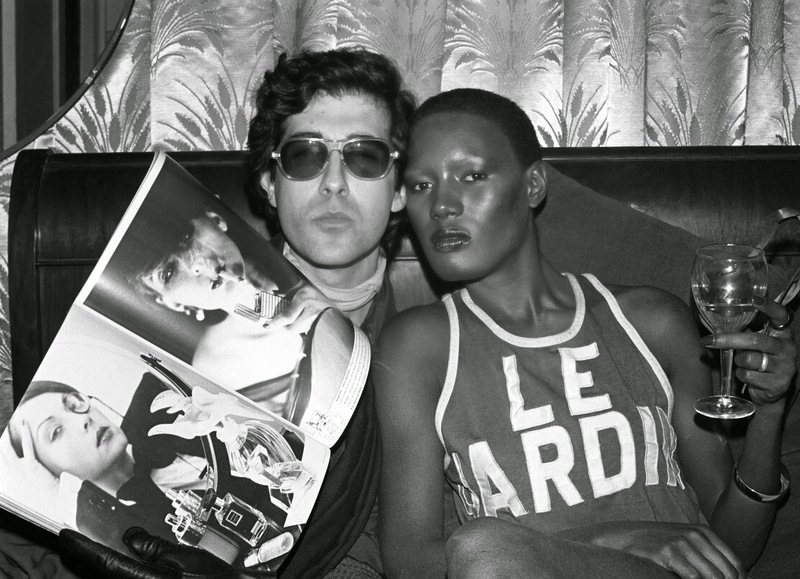 The book is definitely raw, beautifully real, and includes images from a group of movers and shakers that included artist Andy Warhol, John Paul Getty III, Mick Jagger, Iggy Pop, Fashion Designer Zandra Rhodes, Devine, and more. 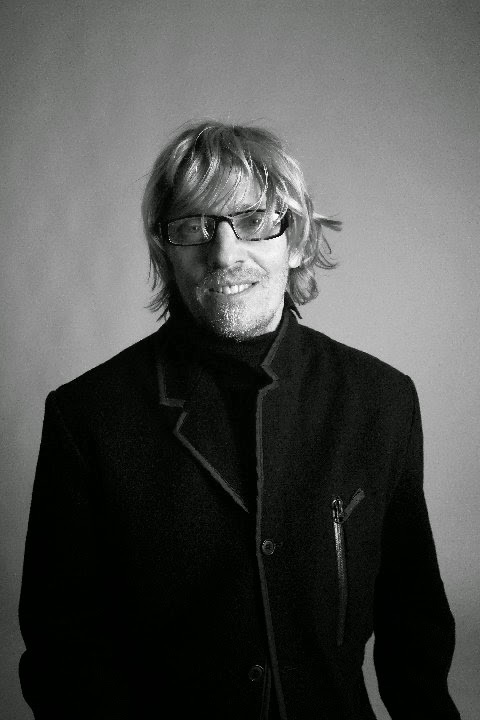 Debbie Harry described Makos as the first to burst on the photography scene and make a name for himself by recording the convergence both the "Uptown" and "Downtown" worlds. 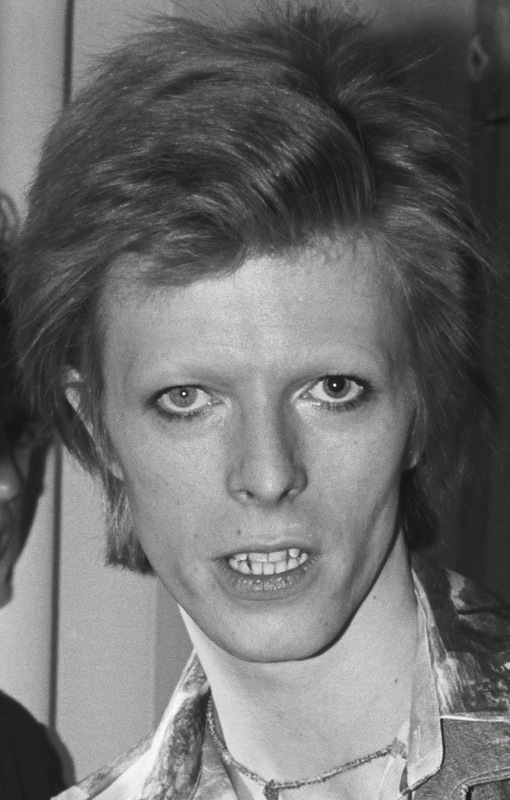 Mix in Tennessee Williams, Halston, Debbie Harry, and Man Ray and you soon see the diversity of creativity abound in their circles. 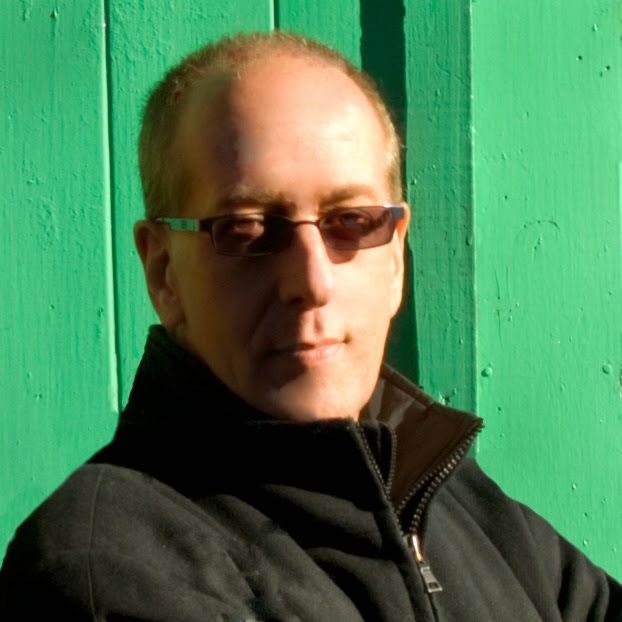 Globally recognized author Christopher Makos, known for his portraiture, has works in the permanent collections of more than 100 galleries, museums and private collections around the world. This book, originally written 40 years ago has become a cult classic, with the new release adding 12 new images in Hardcover format, with essays by Andrew Crispo, NYC Art Gallery Dealer, and Peter Wise, artist. A great addition to any collectors library, please find White Trash Uncut available for purchase at Amazon. Sign up below by email Subscription to keep up with my latest features!